Volunteers flood tornado-tossed Tuscaloosa, Ala. Heavy traffic rolls slowly down McFarland Blvd. 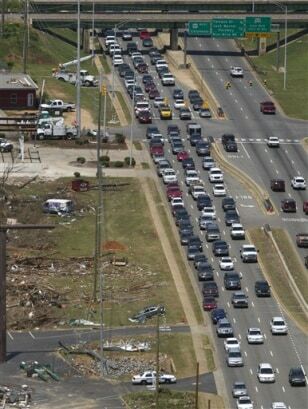 past tornado damage in Tuscaloosa, Ala., Saturday, as volunteers flooded into the tornado ravaged parts of Alabama in such great numbers that the governor's office warned people to be patient with traffic jams.